In our fake debates over whether or not it is better to be a man or a woman, my husband and I end up in the same place: they typically come to an end when he plays the I can pee standing up card... which is always completely and utterly trumped by me pointing out that Life. My body can build babies. Really, there's no topping that. However, the downfall to having a body that can create life every month is the side effects that come along with it. Although all women are different, there aren't too many of us that can say that we have never experienced any physical or emotional symptoms associated with premenstrual syndrome and have looked for some much-needed relief. Having never been introduced to AZO products before, I was pleased to find out that they had taken their comprehensive line of over-the-counter products designed to provide women feminine relief and extended it to now include AZO PMS. Each month, millions of women suffer from symptoms associated with PMS and the all-new AZO PMS is the only brand available that addresses both physiological and emotional symptoms. What woman wouldn't want to get relief from PMS with a fast-acting natural product? With at least 85% of women experiencing at least one PMS symptom as part of their monthly cycle, it's no wonder so many of us get grumpy due to everything from the hormonal fluctuations to the water retention. As opposed to most of the products that you'll find on store shelves, AZO PMS is unique because it is a natural formula that does not contain caffeine (which is known to irritate symptoms associated with premenstrual syndrome). 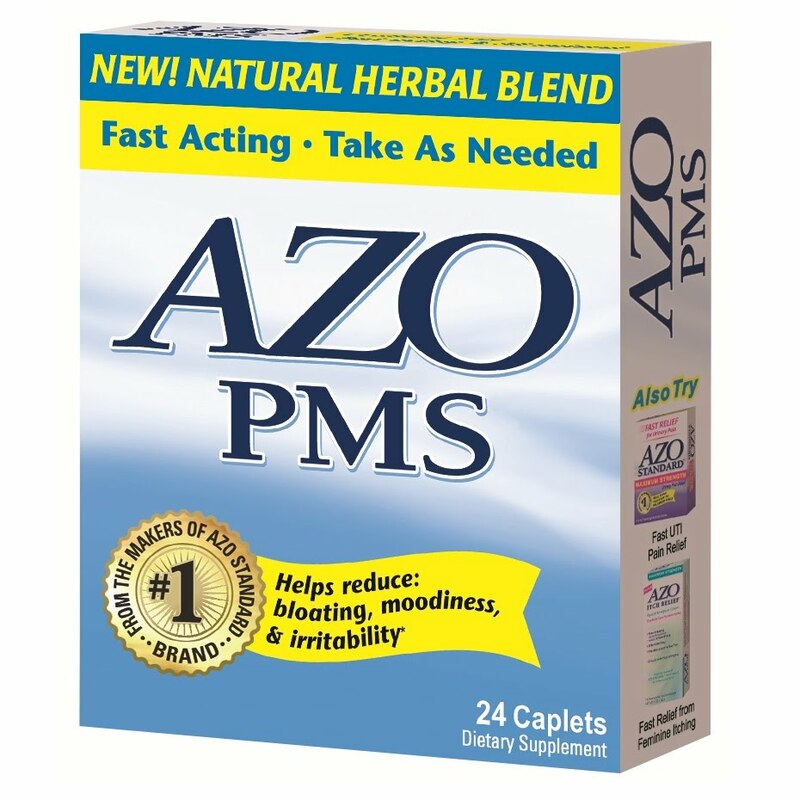 AZO PMS is not a drug, rather it is a specially formulated blend of vitamins, herbal ingredients and botanicals designed to help reduce moodiness, irritability, and bloating. So, for fast relief women can take AZO PMS as needed and know that it will be effective quickly and naturally. What more could we ask for to help make us feel comfortable? Well, how about more than comfort - how about pampering? To help ease the emotional and physical strain of PMS, every woman deserves a plush and luxurious spa robe... and the people that know how to do soothing and therapeutic are the experts at Brookstone. The Brookstone Women's Spa Comfort Robe is perfect for relaxing any time of day. The soothing pink NapSoft material is just the cozy, cushy, comfortable feeling that is great for wrapping up in to help keep away PMS symptoms or just to treat yourself right out of the shower. Combine this robe with AZO PMS and suddenly each month will be a little easier! 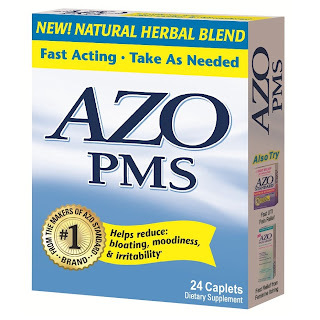 Retailing for $7.49 for a 24-pack, AZO PMS is currently available at Walmart, Rite-Aid, Walgreens and drugstore.com. But of course everything is better with a discount! Download a $1 off coupon from the AZO Products website and bring PMS relief into your life today. 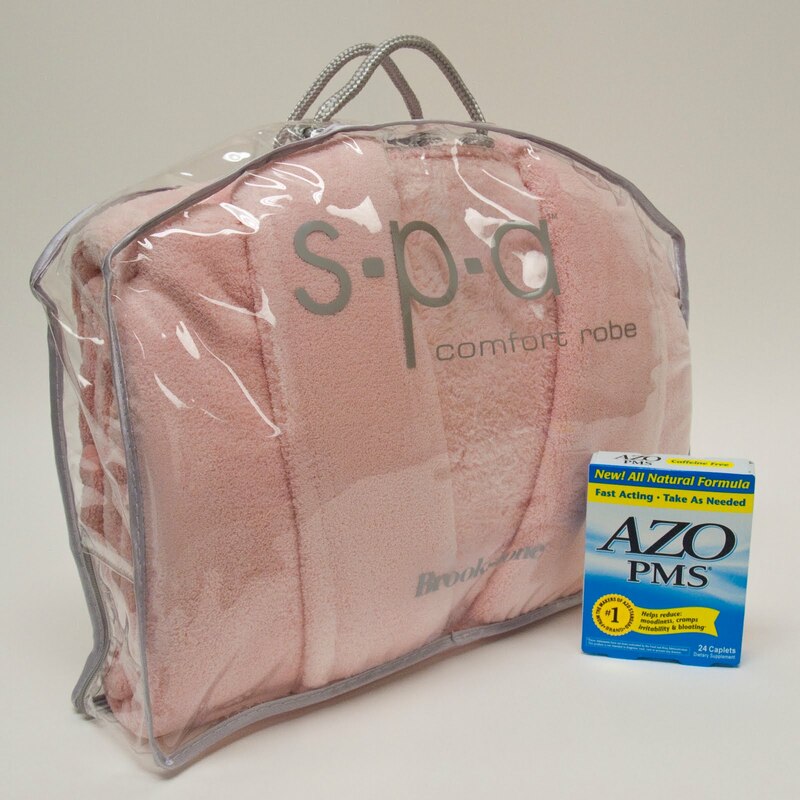 One lucky person will win an AZO PMS Relief & Relaxation Kit (ARV $90) containing a box of AZO PMS and a Brookstone Women's Spa Comfort Robe! To enter to win: Visit AZO Products and tell me or something that you learned there or another of their products that catches your eye. 1 Extra Entry (per method) if you follow AZO on Twitter and/or Like them on Facebook. Giveaway will end on August 11th at 11:59pm CST. Do me the favor of leaving an email address or making absolutely sure it is visible in your profile, I have to have a way to contact the winner. The winner will be chosen by random.org and announced here as well as emailed and will have 48 hours to contact me or respond to notification or a new winner will be chosen. This giveaway is open to residents of the U.S. and Canada only. 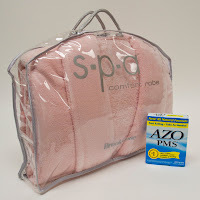 A big thank you to AZO for providing a box of AZO PMS and a Brookstone Women's Spa Comfort Robe for me to review as well as for one lucky giveaway winner. The opinions shared are my own and honest and if you really need to see more, click here to see how I roll. I learned that their Cranberry products promote urinary tract health. I learned that to help prevent a UTI,you can Drink 8-16 ounces of cranberry juice daily to keep bacteria from growing and clinging to your bladder wall. I learned that AZO makes test strips to test for UTIs. I learned that After the flu and the common cold, urinary tract infections are the most common medical complaint among women age 18+, and it has been estimated that up to 60% of women will experience the unbearable pain and discomfort of a UTI at least once during their lives. I learned that the cranberry in AZO CRANBERRY helps maintain a healthy urinary tract by helping to prevent bacteria from attaching to the bladder wall. I learned that you can buy their products online also. I have tried their cranberry tablets for a bladder infection and they work great so they are the ones that always catch my eye! I'd love to try the AZO Cranberry! I learned that, to prevent UTIs and yeast infections, you can drink cranberry juice and use a blowdryer. I've heard the cranberry juice one from movies but never the blow-dryer! I also follow you on facebook, Melinda Ciaccia. From the AZO Products website, I learned that no AZO products contain wheat or wheat by products. I am following AZO on Twitter. I am a fan of AZO on Facebook. The AZO Test Strips sound like a useful item to have on hand. I'd like to try the AZO Cranberry Tablets. I get frequent kidney / UTIs. I would like to try the Cranberry tablets. I didn't know AZO had test strips to allow you to check for a UTI at home! Pretty innovative. Thanks for the chance to win! I swear by AZO Cranberry, but I didn't know they made a UTI test kit. That's what I learned! I would like to try their Cranberry products for ut infections. I like the AZO ITCH RELIEF Maximum Strength. I learned that they make test strips to test for UTIs! I learned that Azo Standard contains Phenazopyridine Hydrochloride, which is prescribed by doctors for urinary discomfort, and that ibuprophen does not contain this ingredient. I like the cranberry product. I learned that "the cranberry in AZO CRANBERRY® helps maintain a healthy urinary tract by helping to prevent bacteria from attaching to the bladder wall." I am interested in the Cranberry. I learned AZO has been in several magazines including Health, Self, Good Housekeeping and more! I liked AZO on FB! I’m entered to win the Rubbermaid High Chair and Tray giveaway! AZO has a full line of products that provide the relief and comfort you're looking for without a prescription.